PLEASE NOTE: Specifications are for information purposes only. Whilst every effort has been made to ensure the product specifications are accurate, due to continuing product development and improvement the specifications are subject to change. Specifications can be used to rough in and fit timber supports in the wall however we recommend no holes are drilled without having the product on site or verifying the details with the manufacturer. Thermogroup cannot be held liable or responsible for errors due to updated specifications. How do I control my heated towel rail? Thermorails are safe to be left running continuously however most times it is preferable to have the ability to control when your heated towel rail is on and off and thus saving you energy. 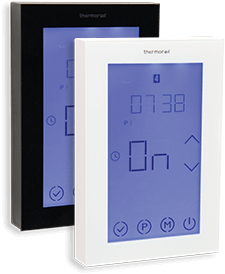 The majority of the range of Thermorails don’t have a switch on the unit but can be very simply wired to a standard switch. Alternatively, you can wire the Thermorail to a timer that can be programmed to turn on and off to suit your lifestyle. When ordering a Thermorail do I need to specify which wiring option I require? Any Thermorail that has Multiflex wiring (symbolised by an ‘M’ at the end of the code) has the option of being concealed or exposed wired at any of the four mounting points. All the parts required for any of these mounting options come as standard with the Thermorail – you do not need to purchase anything extra or specify the wiring required, this can be decided at the time of installation. Can I install the heated towel rail myself? The towel rail is supplied with complete installation instructions so if the towel rail is going to be plugged into a power point then you can easily install the towel rail yourself. However, if you are hardwiring the towel rail then you will require a qualified electrician to wire it up. Multiflex wiring means there is a range of different wiring options within the one rail, so the wiring can be decided at the time of installation. The multiple wiring options available are at either the top or the bottom of the rail, on the left or right-hand side – making it possible to come from any of the four mounting points. Wiring can also be exposed (plug in) or concealed (hard wired). Have you considered adding a timer? With the simple addition of a Thermorail Timer you can ensure that you towel is warm when you need it.